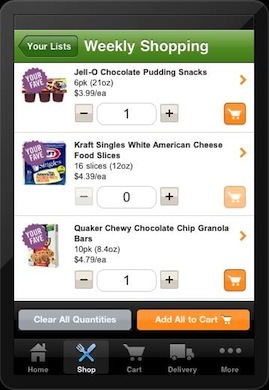 Grocery Shopping in Under 2 Minutes? Yup! Thanks to the iPad. Something incredible just happened! 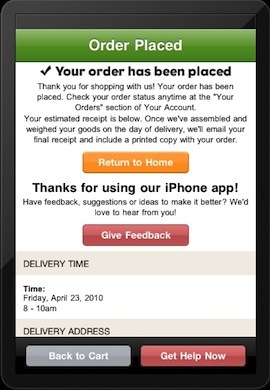 I went food shopping in under 2 minutes….. using my iPad. Growing up, my mother would take me and my two siblings with her when she went grocery shopping. She would pile us three kids in the Dodge Grand Caravan; drive 10 minutes to Walbaum’s; go up and down each aisle checking things off her list; wait in the checkout line with multiple carts full of food; pile us (and the groceries) back in the Caravan; and drive the 10 minutes back home. To my amazement, she always managed to single-handledly get us kids, and the groceries, back in the house and put away safely. We went shopping about once a week, and it took about 2 hours. 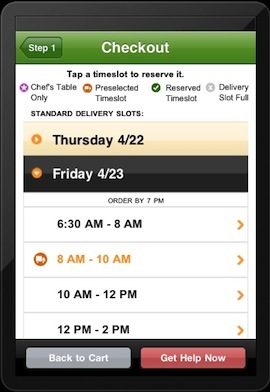 Just a moment ago, I picked up my iPad and launched the Fresh Direct application. Using simple graphics, I slid my fingers down the list, selected items, selected a time for my groceries to be delivered directly to my doorstep, and paid for the groceries with my credit card. Apple and Fresh Direct have transformed a 2 hour, hectic grocery trip into an easy 2 minute experience. Now that’s cool! iPad Camera: where art thou? I have owned an iPad for over a week and have spent much time familiarizing myself with its many functions. While my future blogs will focus on how the iPad can be used in higher education, I first want to address one of the main critiques of the iPad: the lack of a forward facing camera. Speculation on whether the iPad would contain a camera goes back to the early rumors of the product’s existence. 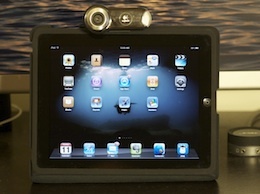 Many believed that for the iPad to be truly revolutionary, it would need video conferencing. I agreed with this assessment until I actually got an iPad. Now, I believe the iPad will make a significant impact even without a forward facing camera. I do not doubt that Apple could sell over a million iPads in April. But this still begs the question: what the heck was Steve Jobs thinking? Why no camera in the iPad? There are two leading theories in the cybersphere: 1) Apple held back to increase profits by forcing people to buy the second generation of the iPad, and 2) the iPad hardware cannot support it. I think both of these theories, and all others I have read about, are inaccurate. My own theory on why the iPad has no forward facing camera is that with it, the iPad would have failed. 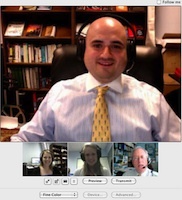 A forward facing camera is important to the iPad for one reason: video conferencing. In one week, Apple has sold about half a million iPads without 3G. With the success of the initial release, I am confident that many more will buy the iPad 3G model. It is not infeasible to see well over 2 million users by the end of 2010. That number of people added to the 3G network, using video conferencing, would cause the system to collapse. I believe there is no forward facing camera on the iPad because the 3G network would not be able to handle to huge amount of bandwidth required for video conferencing. Since the introduction of the iPhone, AT&T has not been the most stable network. Adding 1-2 million (or more) iPad 3G users, many placing high bandwidth video calls, would cause the 3G system to collapse and the iPad’s reputation would be forever tarnished. The iPad was too important to Steve Jobs. It is more important that the iPad work flawlessly then to have a camera. Some people may respond that Apple could have included a forward facing camera and simply blocked the camera from having 3G access. However, it is important to recall that AT&T’s 3G network previously did not allow Skype and other VOIP technologies. Only to fend off possible investigations by the FTC did AT&T and Apple reverse that policy in mid-2009. Therefore, blocking certain technologies from the 3G network is not an option. So, when can we expect to see a camera on the iPad? Not until there is a reliable nation-wide 4G network… but I do expect to see a forward facing camera on the iPhone before such a network is available because it takes significantly less bandwidth to send video at iPhone resolutions than on the iPad. Academic Technology: Do educators have a responsibility to make use of proven technologies? Do educators have a responsibility to make use of proven technologies? Some academics believe technology and the classroom are like oil and water. They think technology has no place in the classroom or in the learning process. I believe this misconception is rooted in being unfamiliar with how technology can enhance the process of teaching and learning. Part of what I do at John Jay College of Criminal Justice is research and development in the field of academic technology, identifying what technological tools can be used in both graduate and undergraduate education to enhance the educational experience. I believe that improving learning outcomes and helping students succeed is what academia is all about. Technology is a tool we can utilize to help us accomplish this mission. Technology has been part of the learning experience since the beginning of human language and civilization. Early civilizations used rocks for hammering and cutting, developed paint to make cave drawings, and eventually developed a written language. Today, academics have a wide array of technological tools at their disposal. We still use ballpoint pens and books, but now have newer inventions and advanced computer-related items. Email, laser pointers, powerpoint slideshows, video conferencing, podcasting, virtual classrooms, document cameras, laptop computers and eReaders can now enhance teaching and learning. Today, there is a shift in the way students absorb and learn information. I recently attended the Hispanic Educational Technology Services’ First Annual Best Practices Showcase in San Juan, Puerto Rico. Dr. Juan Melendez of the University of Puerto Rico discussed how there are major differences between 20th and 21st century learning. He argued that 20th century learning was engineered toward an industrial society which educated the masses simultaneously regardless of the individual. The topics taught in schools were, for the most part, fairly narrow because there were not as many career specializations as there are available today. With all the career choices we have today, it has become more important, according to Dr. Melendez, to give a more individualized, 21st century education, and we can use technology to individualize education. I believe he is 100% correct. By using technology in a way which students conduct their everyday activities, we can maintain their interest, individualize education, and increase student success. Technology has always been with us. It surrounds us. It infuses itself into our daily lives. We can choose to ignore and be ignorant to its potential, or help our students succeed by better understanding technology’s benefits. I feel we must embrace proven technologies to ensure that academia keeps up with the times. We owe it to our students to make use of appropriate modern technologies in order to facilitate our teaching process. In addition, in anticipation of careers which increasingly rely on technology, we owe it to our students to teach them the necessary skills to have successful careers and be leaders in their chosen fields. We need to work together to ensure we give our students the necessary skills for success.